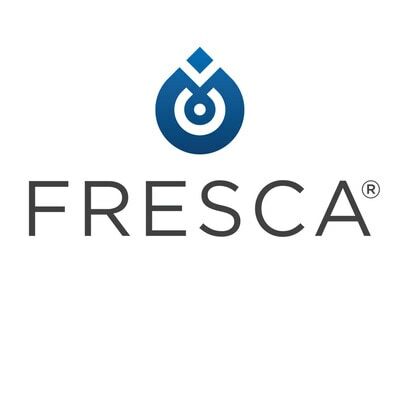 The Fresca Mezzo line features a stunning white double sink with a contemporary look and feel. It has a waved bottom, smooth lines and a thick profile. It sits atop a rectangular wall-mounted floating Gray Oak vanity. Two soft closing drawers open to reveal a fabulous nested drawer storage system inside, creating a total of four compartments. The frameless Medicine Cabinet has two doors with mirrors on both sides and two adjustable glass shelves to hold items of varying sizes. This lovely vanity and medicine cabinet is available in multiple sizes to give a chic, modern touch to any bathroom. 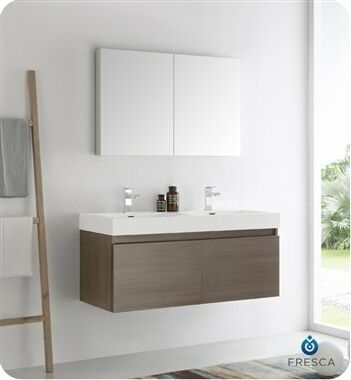 If you’re looking for a minimalist design with maximum appeal, this Fresca Mezzo 48" Gray Oak Wall Hung Double Sink Modern Bathroom Vanity with Medicine Cabinet is for you. This is the perfect line to add a sophisticated touch to your bathroom. The double sink vanity has a smooth front and a lovely Gray Oak finish. Two soft closing drawers open to reveal a fabulous nested drawer storage system inside, creating a total of four compartments. Innovative BLUMOTION drawer runners offer smooth, silent closure, great stability and less sag when the drawer is fully loaded. This vanity provides plenty of storage to keep bathroom essentials neat and organized. The trendy rectangular wall mounted floating bathroom vanity measures 48” in width. The stunning white double sink has a contemporary look with a waved bottom, smooth lines and a thick profile. Each basin is equipped with an overflow and a single hole faucet mount. The frameless Medicine Cabinet is mirrored inside and out. It has two doors with mirrors on both sides, allowing you to keep an eye on your appearance while accessing daily necessities from within the cabinet. It has two adjustable tempered glass shelves that can accommodate items of varying heights. An anodized aluminum frame creates a moisture and dust resistant interior. This medicine cabinet blends beautifully with any decorating scheme. It measures 39.5” wide x 26” high x 5” deep.